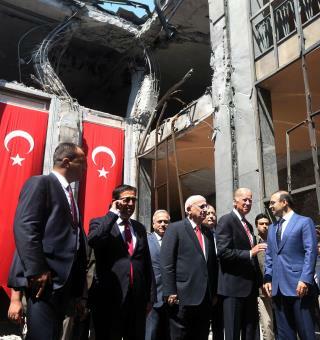 At a press conference, Biden insisted that the US "had no knowledge beforehand of what was to befall you on July 15,” referring to the coup attempt. "Turkey has the United States' unwavering support," he added. The Wall Street Journal. But that support does not involve quickly extraditing the man Turks blame for the coup, Fethullah Gulen, a cleric living in Pennsylvania. "We have no, no, no, no interest whatsoever in protecting anyone who has done harm to an ally, but we need to meet legal standard requirement under our law," said Biden, per USA Today. He urged patience; lawyers from the Justice Department are working with Turkish lawyers on the extradition request. Hours earlier, Turkish tanks rolled across the border into Syria in a bid to oust ISIS militants from the border town of Jarablus, a key site in that it's last big town held by ISIS on the Syria-Turkey border. The Guardian. US airstrikes backed the mission, given that the US and Turkey share the goal of defeating ISIS. But Turkey had a dual purpose: to knock back ISIS and Syrian Kurds who were threatening to take over the town. Those Kurds are US allies in the ISIS fight, but Turkey considers them a threat because a Kurd-controlled border town could inflame Turkey's own Kurdish population. The New York Times. Syria, meanwhile, is also fighting ISIS, but it objected to the invasion as a breach of its sovereignty. It views the Turkey-backed militants as terrorists as well. ArmenPress.am. Convoluted region? In other words, he's over there for a progress report on the superior job they successfully performed in destabilizing the entire Middle East. Interesting looking parliament building... You sure about that tag Johnny?